He's a singer, actor and TV presenter, but has James Corden just proved he'd make a fantastic football coach? Errrmm, probably NOT. 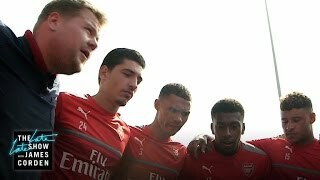 The 38-year-old funny man gave the Arsenal football team a guided tour around Los Angeles recently, with a special training session tacked on the end. Fortunately, we don't think Arsène Wenger has to worry about his job being snatched away just yet!! With his usual dry wit he says to the camera: "Arsenal are a good club but they could be a great club. And who better to show them the way than some guy on a chat show. I think it was Aristotle who said, ‘Inspiration is a big deal’." It's safe to say the professional saw the funny side, with many of them desperately trying to hide their laughter (and shock) in the video. Better luck next time James!